It's always a shame to see hard work go to waste. 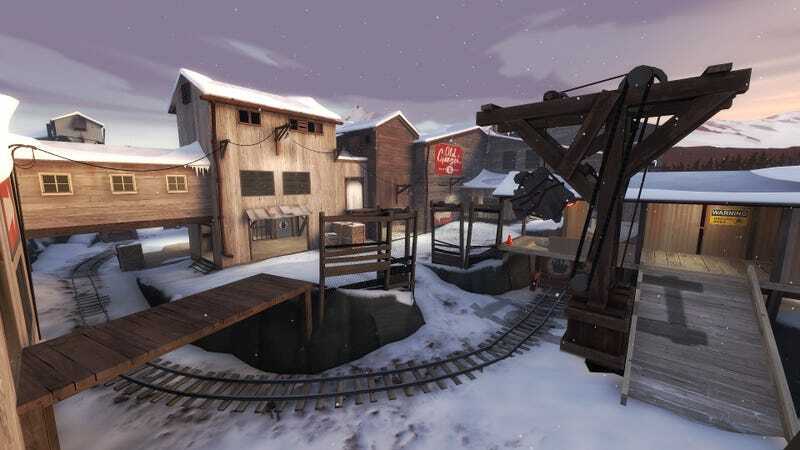 After nearly 40 versions from a pair of dedicated fans, Valve scrapped CP_Snowplow from Team Fortress 2's "End of the Line" update. There's a silver lining to this dark cloud, though: you can still play the map. Right now. This video from ValveTime outlines the history of Snowplow—how it got started, the many changes and overhauls it received over the years, and finally, Valve's decision to pull the plug despite the fact that it's basically a reenactment of the fantastic End of the Line short film. It's an attack/defend control point map that Valve ultimately deemed too complicated and confusing for primetime, despite creators Tim "YM" Johnson and Joe "Fr0z3nR" Radak's painstaking efforts to streamline it. Johnson began work on the map more than a year ago, and it was always an exceedingly ambitious project. Trains, traps, alternate routes based on who captured which points, a mid-match switch to a king-of-the-hill-like structure—all interesting ideas on paper, but also pretty complex in practice. As a result, the map changed and shifted more times than a Harry Potter staircase. A bit later in the process, Johnson teamed up with Radak, a prominent member of the TF2Maps.net community, to iron out the map's many kinks. That's when many felt it got on track to being something special, but that still wasn't enough for Valve, apparently. Johnson and Radak were understandably heartbroken, but they soldiered on and released the map on their own. Still, many fans were not happy, as multiple petitions to have the map officially added to the game attest. Looks like a lot of fun, although I can see how inexperienced players might find it confusing. Still, if you haven't already given it a go (it's been around in its current form for a little while, and in beta before that), it definitely seems worthwhile—if for no other reason than to get a glimpse of what could've been.